Let’s talk about the dollar. 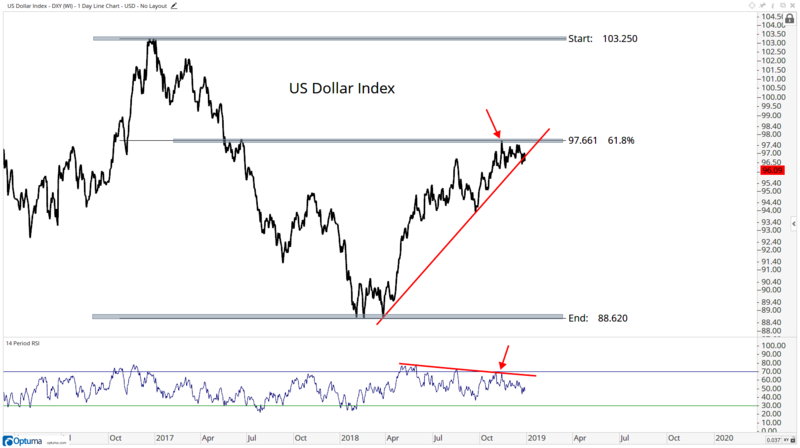 As we start 2019, I think we’re already seeing the implications of a weaker dollar, and I also think this trend is likely to remain in place. 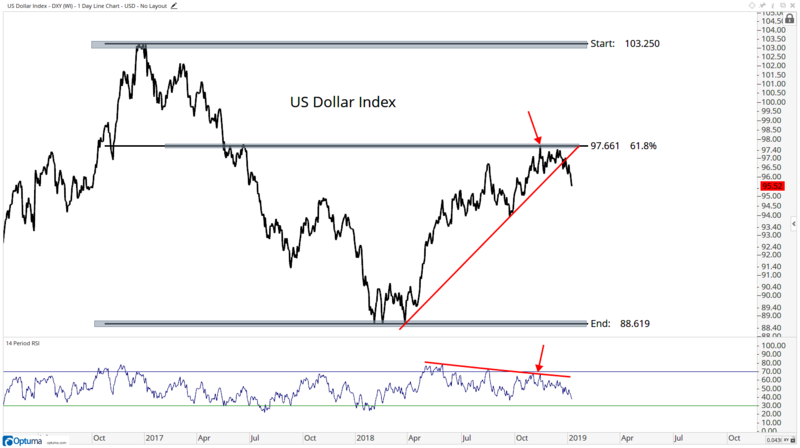 As was clear to me then, after bottoming out earlier this year, we’ve had a nice retracement of that dollar collapse. In fact, index has retraced exactly 61.8% of that entire decline, a logical level for a change in trend. We were flirting with breaking the uptrend line from the 2018 lows which, in my opinion, would signal more weakness. The way we saw it, if the dollar were to just break through these levels, without even acknowledging it, then there is most likely a severe flight to safety away from stocks. That’s why the dollar is getting bid up. The counter-argument is that if the dollar is weakening, stocks would most likely do well in that environment. That has been our thesis coming into the year. We’re in the process of a mean reversion in stocks. 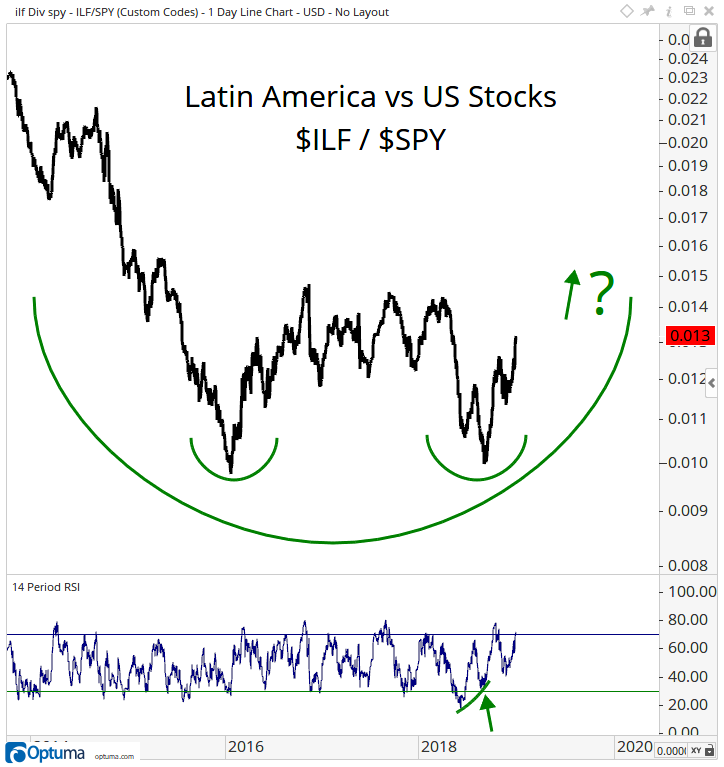 But it’s Latin America showing the relative strength. The relative strength out of this area has been impressive for a while, but with a weak dollar, it is really standing out. So what’s the trade, J.C.? Just give us the damn trade already! Well, there are a lot of ways to get involved. 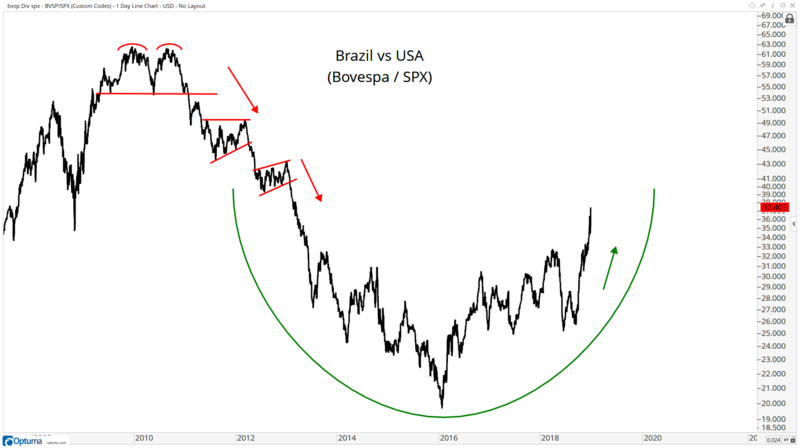 ETFs like the iShares S&P Latin America 40 Index (NYSEArca: ILF) and iShares MSCI Brazil Index (NYSEArca: EWZ) are old classics, of course. But if you’re looking for a little more juice, I like the situation in shares of copper company Freeport-McMoRan (NYSE: FCX). Commodities and materials can do well with a weak dollar. In this case, if the dollar continues to decline further, the price of copper will rise because would it take more dollars to buy the same number of units of copper. Look at the lows in FCX around the middle of 2017. During the December declines, Freeport broke below those key lows, but is now attempting to recover. Notice how this whipsaw is being accompanied by another bullish momentum divergence. 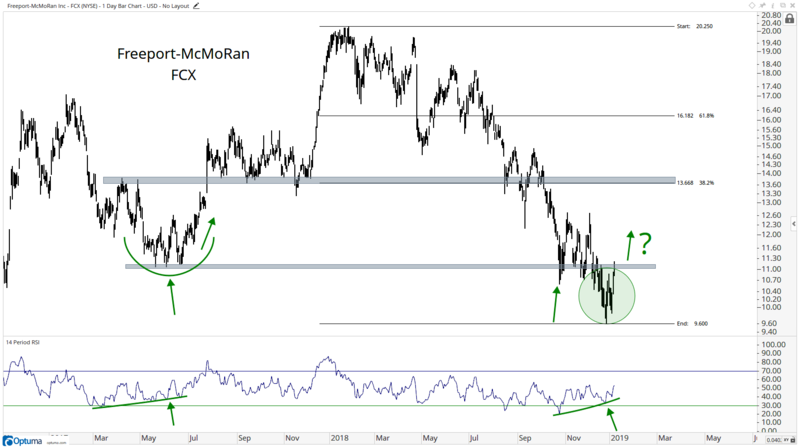 I think if we’re above $11 in FCX we need to be long this space, particularly shares of Freeport-McMoRan. I believe $13.70 to $14 is a good target here tactically, as it represents a key retracement and former support in 2017. Why does the company capitalize letters in the middle of its name? I don’t know. But the risk versus reward is in our favor, so we won’t ask questions. Other than, want more trades this quarter? I’ll have more each week in Breakout Profits. I’ll be following this dollar trend, and others, closely.